Only in Minnesota — Cuyuna’s Yawkey. Think Boston Red Sox – Tom Yawkey who owned the Red Sox during that time also had industrial mining interests in Cuyuna. It was four years ago. I was in my first meeting as the newly elected volunteer president of the Cuyuna Lakes Mountain Bike Crew. 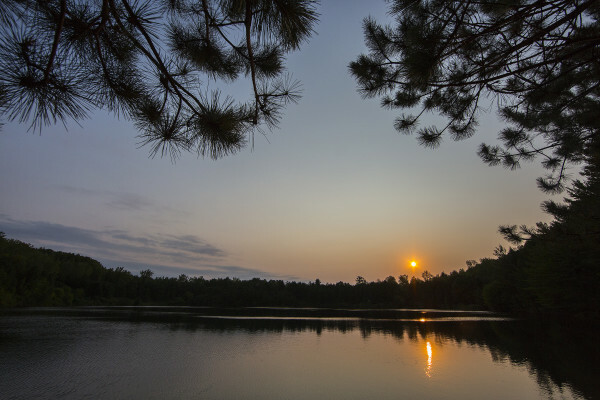 The meeting was with the Advisory Council of the Cuyuna Country State Recreation Area (CCSRA) in collaboration with the Minnesota Department of Natural Resources (MN DNR) Parks and Trail Division. The MN DNR is the land owner of the CCSRA. In the first few seconds of the meeting the MN DNR presented this idea, “What do you guys think about creating a yurt campground in Cuyuna?” I believe my reply statement was: “I first, second, and majority approve this idea, please begin tomorrow.” Coming from my downhill ski background, creating a ride-in, ride-out, year-round campground was everything to our future Cuyuna where the region is purposefully built for the experience of our outdoor enthusiasts. Haul in, ride out. As Cuyuna’s Yurts at Yawkey are located adjacent to the mountain bike trails, you’re one cart trip away from packing in your belongings for a sweet adventure. One cool point to mention is this cart, it’s for firewood, also works great for hauling in belongings, and wildly reflects the industrial heritage of Cuyuna’s mining past. What? That just happened. Sorry Oregon. O, and by the way, Uncle Gomez is visiting the Yurts in January. He’ll provide additional insight as to the winter experience of the destination as Cuyuna is currently doing very well with sweet winter snow on the single track! Join me on the voyage into Cuyuna’s Yurts at Yawkey. The photo documentary starts now. Small yet big. The Yurts provide overnight lodging for up to 7 adults providing 2 of the adults don’t mind cuddling up on the fold down bed. I’d suggest lodging 6 adults at max for a comfortable experience both in, and out of the Yurt. 3 adults would be a posh setting. Lots of room to stretch your fat-bike weary legs. Shred the red. Within seconds of the yurts are a few of Cuyuna’s flagship trails including Bob Sled (as seen here), Timber Shaft (expert technical terrain) and Haul Road (Beginner fun fest). All in all Cuyuna currently delivers over 28 miles of purpose-built single track with the long term goal of 75 miles of single track being prescribed within the Master Vision for Trails. FAQ #1: What’s a yurt? Where did that name come from? Yurt, that’s Mongolian for a canvas sided hut. Genghis Khan, one of the early outdoor adventurers, used yurts for being able to lodge his army effectively. The canvas sides allowed heat to be reserved within the interior of the yurt. Fast forward to 2016, nothing changes. We celebrate the MN DNR for thinking ahead and installing wood fireplaces in each yurt allowing for year-round lodging. From our experience, at 0F you’ll want to continue stoking the fire to keep the heat comfortable within the canvas sided circle. Alternatively, in our 95F summer, the yurts gather heat like a sauna, but, with the windows and pop-a-top-bubble atop the yurt ceiling, the heat can be exited from the structure incredibly effectively. The yurts answer a demanding need of serving outdoor enthusiasts who don’t want to camp in a tent on the ground, but still want an outdoor experience. Speaking from experience, having the actual interior space of the yurt and the outside shelter/cover is great should it rain. Your adventure continues, you’re not held hostage by wet skies huddling in a tent. From an interior appointment point of view, these yurts are outdoor luxury. I felt like I was walking into Vail for my adventure, not my backyard. Man made mountains? What makes Cuyuna’s story unmatched is the entire terrain is man-made. From the open-pit and shaft mining, this land was first exploded or pickax chipped from the bedrock, and secondarily placed in overburden piles that nature has now reclaimed. The mountain bike trails are purposefully constructed along the contour of those overburden piles, providing a constant flow that forces happiness upon the cyclist. Enjoy the night ride. Daily to 10pm, enjoy the darkness, let it soak in, along with the big dipper, the northern lights, a full moon, and the always-appreciated shooting star. Year round you’ll enjoy riding face to face with whitetail deer, turkeys, coyotes, porcupines, beavers, and the very rare but possible, black bear. We ride for this. Push it, spin it, mash it for hours to get to the end of the day. Sit back. Stare at the stars. Enjoy the sound, the smell, and the sight of fire ripping apart dry wood. This is the heart of it all, the adventure after the adventure, and the motivation for going outdoors, every day. Here again I applaud the MN DNR in the design of Yurt courtyard. A great fire ring, campfire wood at the ready, canopy cover should it be raining, and a food box to keep that previously mentioned black bear (or Cuyuna yeti) out of your goody stash. Also, it should be mentioned, the Yurts do not have electricity nor wi-fi. Bring your lanterns and flashlights. Good times await. Evening spirits. As an FYI, firewater (alcohol) is not permitted within the Cuyuna Country State Recreation Area or the Yurt Campground. The reason being the CCSRA is a State of Minnesota owned/managed property. However, the Spalding House in the City of Crosby is just a short distance from your Yurt where you can sample craft beer including Cuyuna Red from Jack Pine Brewery. Ride and shine. I don’t know about you, but, there’s nothing better than hot coffee brewed over campfire as the sun rises at the dawn of another day of shredding. Is there a better moment? Get to know Yawkey Mine Lake. Waking up early provides it’s reward. By the way, bring your fly-rod, trout swim in this lake. And, if you’re looking for a real winter adventure, ice fish this lake. Lakers live down there, and some of them are quite ginormous. Locals do locally sourced. What you see here is sunfish as captured from the Sagamore Mine Lake, eggs from the East Yawkey Farm, Schaubach Family Farms maple syrup, and wild rice as harvested near Mille Lacs Lake. We call this food to fuel, not food to fill — a world-class breakfast to match the world-class fat bike destination. If you’d rather enjoy a breakfast in town, check out the North Country Cafe in downtown Crosby, the eggs benedict are quite good. Ride. Ride. Ride. Shown above left is the Tugger trail, one of my personal favorites for riding over the shale of Cuyuna’s history. Seriously nice rock structure for mountain-less central Minnesota. The photo to the right depicts the trail convergence of Tugger and Trout where you’ll cycle right past the Yurts, access to the Yurts is provided by another trail access through the main parking lot, but from this elevated point-of-view you’ll get an intimate tour of the campground. This photo is fitting to Cuyuna’s personality. A new pine tree grows from a rock. The people of this region also share an unquenchable desire to break new ground forward. To prove the impossible, possible. Through my Finnish heritage we call it “sisu.” Inner strength, fortitude, and burning desire for excellence. That’s Cuyuna. It’s a great place to call home. And this is the experience that Uncle Gomez will walk into in just a few short days. I wonder will Uncle Gomez stay toasty in the yurt? Will the yeti show up at Gomez’ yurt at the strike of midnight? So many questions to be answered, we look forward to Gomez’s full winter report to follow! And, in Cuyuna we have another year-round, ride-in, ride-out property that just opened. It’s called True North Basecamp, expect to hear and see more about that in 2016. Somewhere, in a moment of clarity back in August, I decided to ring in the New Year up in a Yurt at the Cuyuna recreation area. I had learned about the Cuyuna Yurts from Aaron during editorial meetings. We had talked about him writing a story about the Yurts for about a year or so, leading up to my trip. My trip to Cuyuna, not only takes place in the opposite season as Aaron’s, but it also comes from the perspective of an ‘out of town’ tourist, instead of a local resident, race promoter and trail advocate. I asked Sven if he wanted to come along and join in the fun, but he never really showed much interest. I asked mi amigo Adam, aka : Fattie Lumpkin, if he was game for some glamping over the New Year and he was in from the start. We met up in MPLS and crammed 2 bikes and all of our gear into my truck and drove up to Cuyuna on New Years Day. Cuyuna is a mere 2 hour drive from the Twin Cities, but we couldn’t check in until 3:oo so we took our time. After a leisurely drive, we found our Yurt and after a couple of sled-loads of gear shuttled from the truck, we were in business. I stoked the fire in the wood burning stove and Adam headed out for a quick recon of the Yawkey trails. The sun set and the temps dropped down into the single digits. We settled in for the night and played some cards after dinner. I got up in the middle of the night a few times and fed the stove. My midnight nature break revealed a sky full of stars and the dazzling milky way. It was cold enough that the air hurt my nostrils. The next morning we geared up and rolled out the door to the trail. We hit Man Cage and Manuel Drive first and then Tugger and Bobsled. The snow conditions were absolutely perfect. The trails had been groomed just before we arrived and the trails at Yawkey are super fun! We rode every trail in the Yawkey cluster and our favorites, more than once I think my favorite trail was Bobsled, with Man Cage coming in a close second. We ran into JP LaMere and a group of his posse out near the trailhead. JP was keen to show us his new full carbon rig and grabbed my camera to take shots of me hoisting it with just two fingers. It looks like I’m about to spike the thing in the pictures, but that never happened. JP and his crew were staying at the True North Basecamp, up the road, and somehow JP told us that he was not entirely satisfied with the operation. He told me that Otis was way too heavy and that I should be riding one of his carbon machines. We agreed that we should do another test of his latest full carbon bike down the road. Adam and I jetted back to the Yurt for lunch and then hit all of our favorites from the morning again, with a trip out the haul road trail (where I crashed). We ended our afternoon with a final run down bobsled, with sun setting shining magic pink light across Yawkey Lake. We stoked the stove and ate swedish meatballs, with some left over chili verde, from the night before. We played cards and kept the fire stoked. The stove in the yurt kept things nice and cozy. Not hanging out in shorts and t-shirts kind of warm, but definitely not cold. Adam and I came prepared with our full winter arsenal of ride and camp clothing, so we were pretty happy with yurt living. YMMV. Our last day, we decided to head out and explore the trails outside of the Yawkey Unit. We headed out on the Haul Road Trail and crossed over Hi-way 6 into the Portsmuth Unit and rode the Drag line and up to the top of Man High Hill and then further on to the Swithback Trail and Pennington mine into Cyuna Lake Unit. All of this is groomed singletrack. The Cuyuna Unit was where I had thought that I would turn around, but I was feeling pretty good, So Adam and I headed up the trail a little further. Once we turned off of Cruiser and headed up the Miners Mountain trail, the conditions (and my gas tank) had me looking for the trail back to the Yurt. I split up with Adam, who wanted to explore a bit further and took the Tremmel trail down to the Cuyuna Trail. The Cuyuna trail is a wide rail-trail sort of arrangement that they groom with a big wide ski groomer. This was the first time, this year, that I had the opportunity to ride fresh corduroy. I wasn’t the first person that had been out, but the grooming was fresh enough that, there were still some fresh tracks to be found. The corduroy makes really weird designs on your front tire as you ride. I found myself cruising along, feeling great, making candy cane swirl designs on my front tire by carving turns across the grain of the grooming and trying to ride lightly and not bust the crust too much. Adam ended up taking the singletrack back the way we had came and we met up back at the Yurt. If I lived in Minnesota, I’d spend a lot of time at these trails. So much time, it might be worth buying a miner’s shack as a vacation property. But short of that, I think that the Yurts or the True North Base Camp should be on every fat-biker’s radar as a ride destination! Aaron is the President of the Cuyuna Lakes Mountain Bike Crew, the trail stewards of the Cuyuna Lakes Mountain Bike Trails and the Cuyuna Lakes IMBA Ride Center. Cuyuna is located in the center of Minnesota, 2 hours north of Minneapolis/St. Paul and features 25 miles of purpose-built single track and is also mechanically groomed for winter mountain biking. Fantastic write up! Gomez now you know where I sent that picture from… 1st snow Cuyuna. Aaron is a great person! a steward of this great place. It is always nice to run into him at the Whiteout or on the trails! I have been riding and racing Cuyuna for some time…. I can never get enough. This years Whiteout was a amazing time. Soon to be back up here. Thank you for this article… you nailed it. Trails are as good in winter as they are in summer! Love the Cuyuna write-ups. That place is worth the trip from wherever you are.